The adult leaders of White Stag Sierra are all volunteers. Some attended the program as a child, and some have children attending the program today. Some of their children are in college but they love the impact White Stag has on youth! Out adult leaders have a combined total of over 300 years of service to the organization. Why do they keep coming back? Read on. 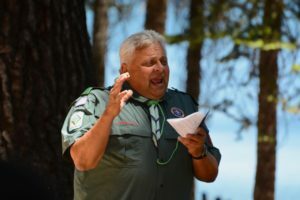 Program Director Larry Challis attended the camp as a youth in 1964. He returned to the program in 2009 when his children reached White Stag age and helped restore vitality to White Stag Sierra. Larry grew up in Carmel, California and first attended White Stag in 1965 at age 13 at Camp Pico Blanco. He later became a member of the youth staff. As an adult, he moved to the Sacramento region where he founded a mortgage brokerage. When his sons became Scouts, he learned that White Stag was still operational on the Central Coast. Larry served on the White Stag Academy’s adult staff in Monterey for four years and his sons later joined the youth staff. 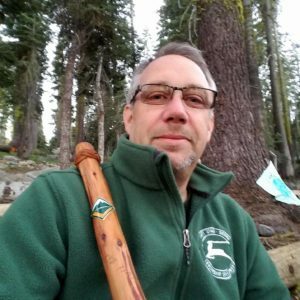 In 2014, Larry was asked by the leaders of the White Stag Association in northern California to become the Program Director of White Stag Sierra, where he has continually served since. Larry is an active member of his community, serving in the Kiwanis, church, and troop leadership positions. Association President Tom Weibert first attended White Stag as a 12 year old boy. His mom served on adult staff; his son and daughter on youth staff. His family is the first to have three generations who are Silver Stag recipients. Tom first attended White Stag in Monterey in 1978 when he was 12 years old. He joined the youth staff and his parents served on adult staff. After college, Tom returned to serve on adult staff. Tom founded a management consulting and marketing business in the San Francisco East Bay. When his children became teenagers, they too attended White Stag. Tom has served on the White Stag Sierra program’s adult staff since 2015. He is also currently the president of the White Stag Association. Tom is a recipient of the Silver Beaver award for his outstanding service to the Mount Diablo Council.